AUTEUR ARIEL: Yeah...I really own that. So last week, I had the amazing honor of guest posting on Twenties Girl Style for Ashley's 'Yeah...I really own that' series! According to Ashley, a 'Yeah...I really own that' piece is "a piece of clothing you purchased at some point in time and are not really sure why. At the time of purchase it seemed like a great idea but eventually you forget all of the reason's why/how it made its way into your closet and are left with only feelings of buyer's remorse or embarrassment. You would think these would be the first things to go when you have a major closet purge, but for some reason or another you just can't let them go." I think this idea for a series is genius because we all really do have that one piece of clothing we have a secret love for! There are some amazing bloggers on the list of people who have already contributed to this series so be sure to check them all out HERE! Anyway, I decided to share with you folks my 'Yeah...I really own that' piece today on my blog in case you missed it on Ashley's blog! Believe it or not I graduated from college with a degree in Film--it's a big passion of mine but I don't often get to practice it that often so a lot of people don't know I'm an undercover film geek. I love everything from comedies to documentaries but a favorite category of mine is classics--and what better classic is there than Star Wars?? 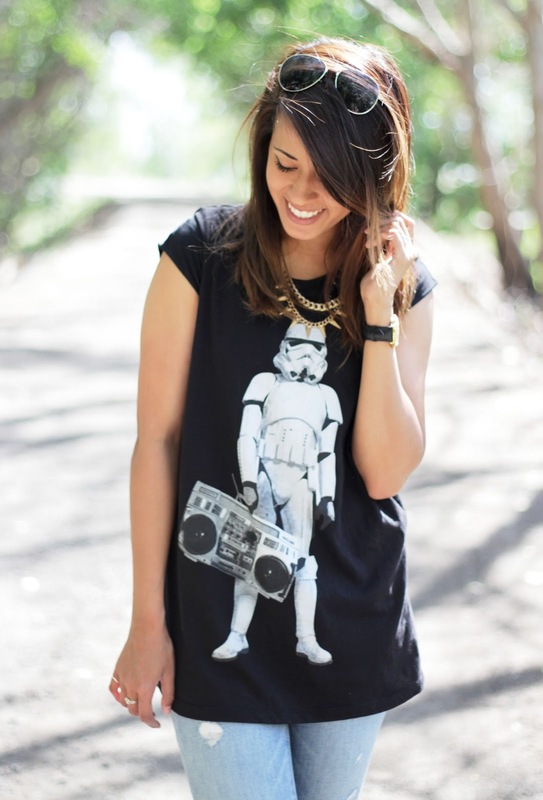 So when I saw this "Boombox Stormtrooper"Tee at Forever 21, I couldn't resist buying it because it was just too perfect. My husband thinks its a little silly whenever I wear it out but I shamelessly love it. I've worn it to the gym, out to eat, and even dressed it up and featured it on my blog a while back (see that post HERE). For this outfit I gave it an edgy look with the skater shoes and spiked necklace--I was feeling nostalgic of my high school years when I thought I was Avril Lavigne... What can I say? This tee displays my hidden love for a classic 70s Sci-Fi flick. Soooo yeah, I really own that. haha, i love that tee! you can totally rock it! haha love this. everyone needs one of those "goofy, dorky but totally awesome" shirts. I love this look! 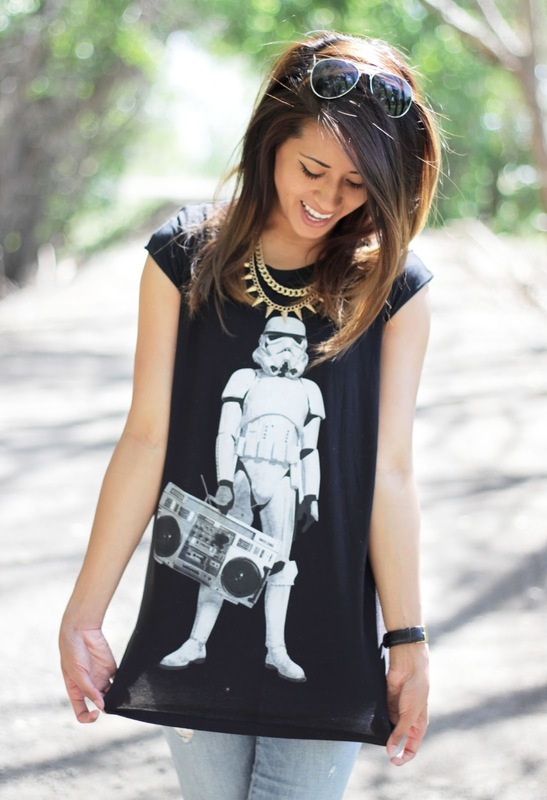 I have a storm trooper shirt too and I love it. You always have such good style. love it! this whole look is adorable. lovin your blog! 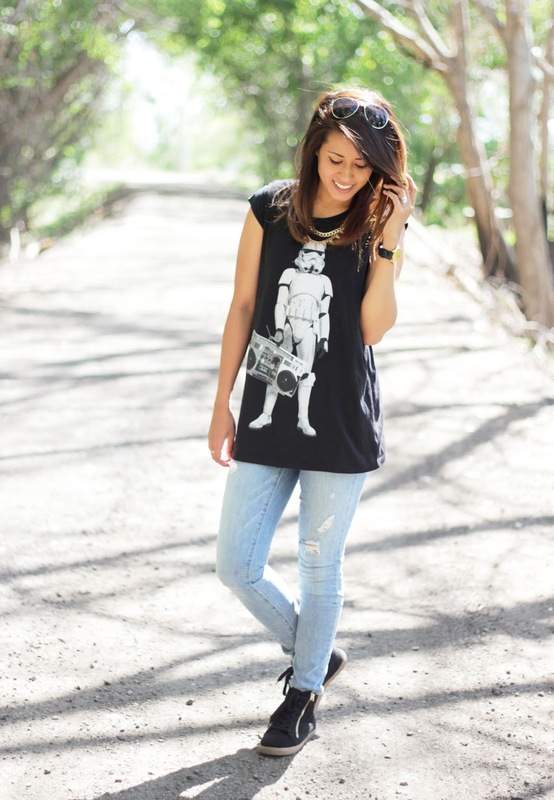 I love graphic t-shirts, I've never seen a star wars one though. It works well with your jewellery! You look great. adorable! you styled this perfectly!